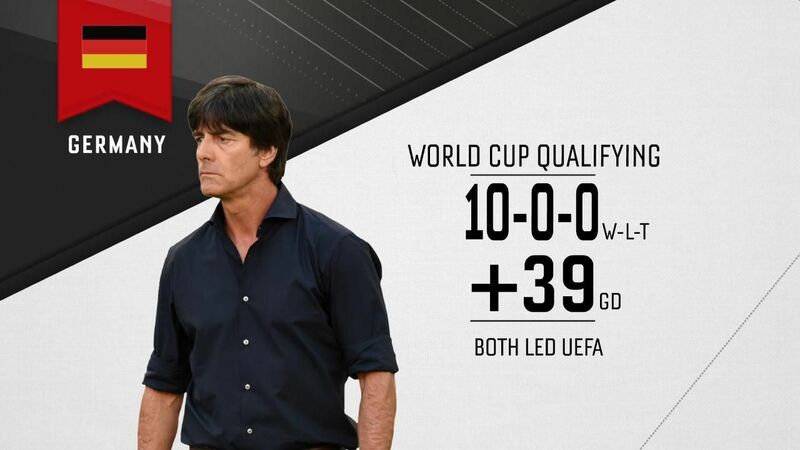 World Cup holders Germany were never in danger of not qualifying for Russia. Low's men finished Group C with a 100 percent record, beating Northern Ireland, Czech Republic, Norway, Azerbaijan and San Marino at home and away. They conceded only four goals and scored 43: the highest total in all European groups alongside Belgium. Germany were in control of their group from the outset and also found the energy to win the 2017 Confederations Cup with an inexperienced "B squad." Future Bayern Munich midfielder Leon Goretzka in particular impressed as he announced himself on the world stage. One again going to the World Cup without a star player, Germany's biggest strength has always been the team spirit, the idea that a strong group of players will always be superior to individual talents -- and they have such squad depth they've been able to leave Manchester City's Leroy Sane behind. With most players available for the training camp after the Bundesliga's plight in Europe, Low will be able to work on ideas for the big games in the knockout stages. Backed by one of the most advanced data systems in world football, they will not only develop strategies for both attack and defence but also continue to improve their set-piece tactics. At the 2014 World Cup, Germany scored five goals from set pieces -- more than any other nation. Although they're not overly reliant on individuals, the possible loss of goalkeeper Neuer could turn into a problem. Redefining goalkeeping at the 2014 World Cup, especially in the round-of-16 match against Algeria, the Bayern and Germany captain has not played a minute of football since September. He hopes to be fit in time for the opening match, but doubts over his fitness and his confidence in his body will remain. Barcelona's Marc-Andre ter Stegen, the backup solution, is a very good option, but Neuer still ranks above him. The goalkeeper spot could become Low's catch-22. Toni Kroos has been the unsung hero of the Germany team for many years now. The Real Madrid player has played in seven consecutive Champions League semifinals for Bayern Munich and the Spanish giants, whom he joined in 2014. He dominates midfield, and his calm distribution dictates the pace of Germany's game. His ability to get himself into dangerous positions near the box make him one of the most complete midfielders in world football. The Germany team has been flying high ever since the reboot of German football in the early 2000s. They have reached the last four at the 2006, 2010 and 2014 World Cups, and the 2008, 2012 and 2016 European Championships. Coming out of a difficult season for Bundesliga football, where Bayern again walked away with the title but were stopped in Europe once again, some players might be running low on confidence. On top of that, in recent tournaments defending champions Italy and Spain both failed to make it to the knockout stages. In spite of that, Low's XI will beat the curse of the titleholders and should reach a seventh consecutive semifinal. From there it's just a short walk to the final.